When you first begin to think about your career, your early twenties seem to promise unlimited freedom and opportunity. You’ve not started down a particular path of industry yet—you have all the mobility and time in the world to choose what it is that you want to do. But, in reality, by the time you’ve finished an undergraduate degree—particularly in a vocational or STEM subject—it can feel like your career’s been chosen before it’s even begun. What happens if you decide that you want to find a new path? What do you do with your skills if you don’t know which industry you’d like to pursue a career in? For early-career businesspeople with questions like these, a master’s in management could be the answer. For Ebunoluwa Akinyele—Ebun for short—a biochemistry major who recently graduated from the Master’s in Management course at Cranfield School of Management in the UK, it was the jewel in the crown. “I decided to do a master’s in management because I had a degree that I realized I wasn’t interested in anymore,” Ebun says. This breadth of focus was especially apparent to Ebun on the course at Cranfield, where modules cover economics for managers, to research methods and statistics, to managing profitability, liquidity, and asset utilization. Comprising 10 core modules and three electives, the course gives students the chance to immerse themselves in many different aspects of business, including one module, Effective Cross-Cultural Management, that takes place in Granada, Spain. This learning process ultimately culminates with an individual thesis project that involves a three-month internship with one of Cranfield’s corporate partners. Given Cranfield School of Management’s historical ties to industry, students are frequently placed in highly desirable sectors, giving them experience in roles they would not have been able to obtain without the master’s. For Ebun, this opportunity took the form of an analyst role at Skanska—the fifth-largest construction company in the world, according to Construction Global magazine. She’s now a permanent member of the team, and is even supervising a current MiM student while they do their internship at the company. The internships on the Master’s in Management are organized by Hannah Piazza, the internships and projects manager in Cranfield’s Career Development Service. The Career Development Service is a key part of the internships program at Cranfield, offering expert advice on producing a professional CV as well as coaching on interview skills. Hannah also monitors the students’ placements throughout the process, many of which end in offers of permanent employment—as, indeed, was the case for Ebun. She interviewed at Skanska and got the internship role, and now, a year on, she’s glad she did. 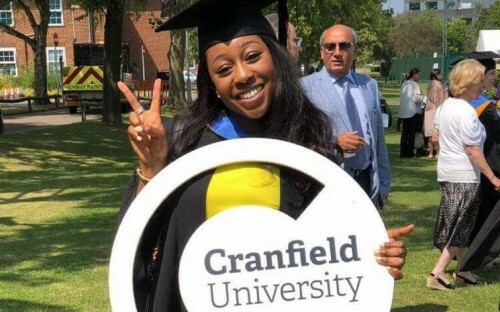 Being in a project management position, Ebun says that one of the key things that studying at Cranfield School of Management gave her was the ability to conceptualize the challenges that face teams in business situations. She cites the simulation that students undertook as part of their project management module as being particularly useful: “If I’d come [to Skanska] without having that knowledge, I would be a bit more confused as to how and when and what to do,” she says. But it was not just the teaching or the internship that Ebun pinpoints as being influential to her current style of management—it was also her cohort. “Cranfield School of Management is quite an international university where there are people from all over the world,” Ebun says. “I was able to learn how to communicate with people and learn about different cultures and ways of life.